Nychos is a renowned Austrian Street Artist. One of the most prolific of the European scene. His style is characterized by pop surrealist and often has a sordid and critical content, particularly on media and society. 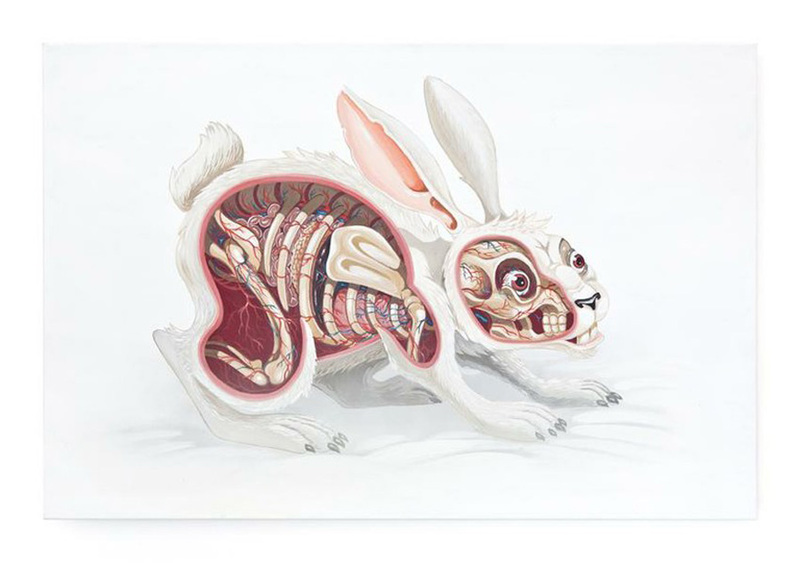 He is a wonderful illustrator and he dissects and disembowels animals that fill his compositions to put them better into light. He was born into an Austrian hunting family in South Africa and spent much of his childhood seeing things which many ‘normal’ people would consider cruel or even brutal. For Nychos though, it was a fascinating world. At seven he was bitten by a boar while he was playing in the forest close to home. Just a little while later he had boar meat for lunch. In another instance he saw a dead baby lamb being consumed by maggots the same color as its fur. Instead of being horrified, he was fascinated. He studied the hidden insides of animals and noticed the way life often grows from other life. At the same time he was also a child of the 80s, growing up watching cartoons and being influenced by their flashy bright colors. Nychos has done collaborations with international giant urban art scene as Roa, Aryz, Satone, Zedz and Wany.